The spectrum and severity of respiratory illness in the newly born has been changing over the past three decades with the introduction of antenatal steroids, improved management of the fetus during preterm labor and birth, and postnatal exogenous surfactant administration. Early pulmonary parenchymal failure requiring invasive ventilation occurs less frequently. 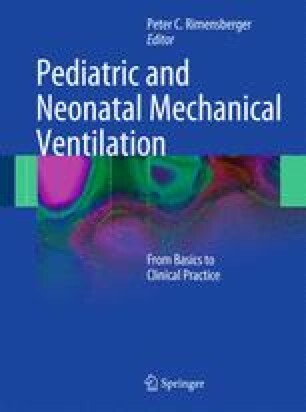 Moderately preterm infants who received invasive mechanical ventilation in the past can often be managed nowadays with noninvasive respiratory support. There is, however, a “new generation” of surviving extremely small infants who depend on early initiation of invasive ventilation and who stay on the ventilator for extended periods of time with substantial risks for ventilator-induced lung injury. Such infants often require invasive ventilation for reasons other than surfactant deficiency. These comprise, among others, respiratory pump failure and intermittent failure of the immature respiratory rhythm generator and control of breathing. Diverse invasive mechanical ventilation strategies and modalities have been developed to better address these problems; however, evidence of their effectiveness is still scarce. Therefore, the clinician’s expertise in some of the basic invasive ventilation techniques and devices probably remains the key determinant of a successful application.